Egg yolk powder is made from egg yolks which is the yellow portion of the egg, it is extremely nutrient dense, contains natural healthy fats, essential amino acids and is rich in vitamins and minerals. Egg yolks have a high biological value and are readily digested. Eggs as a whole food are highly nutritious and can be used in a variety of ways. However, fresh eggs can be difficult to in many situations and therefore egg based protein powder can be a practical solution. Why choose Egg Yolk Powder? Egg yolk powder is suitable for people looking to increase their intake of healthy fats and other essential vitamins and minerals. 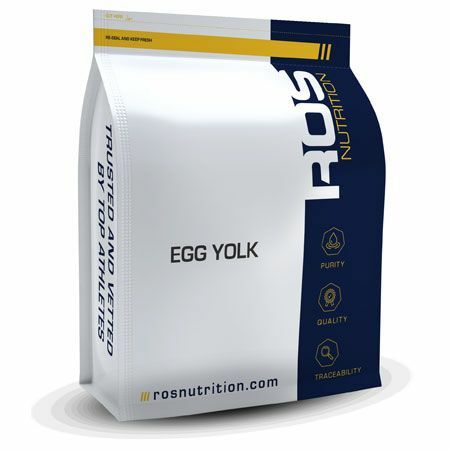 Egg yolk powder is particularly beneficial for people aiming to increase muscle mass and improve their strength. Egg yolk powder is convenient and highly practical for baking, cooking and making various recipes. It is a highly versatile product that can be used for a multiple of nutritional purposes. All you have to do is add water to the egg yolk powder to make liquid egg yolks. Egg yolk powder are pasteurised and do not have to be refrigerated. g = gram, kcal = kilocalorie (read as calorie), kjoule = kilojoule, % = percantage, EU RDA = European Recommended Daily Allowance. For best results take 2-3 servings daily; (1 serving = 10 g or 1 scoop in 250 ml of water).